Choosing your fabricator (whether it be for natural stone, quartz or any other slab product) will be the most important decision of your countertop purchase. Choosing the right fabricator for you is even more important that selecting your stone. Why? Because the right fabricator will help you know what stone is right for you. They will tell you if your slab has any issues before they cut it. They will tell you the pros and cons of marble. They will teach you how to take care of your stone so that it remains beautiful for a very long time. This is our job as a fabricator and yet, unfortunately, a lot of fabricators don't take these steps before, during and after your job is completed. 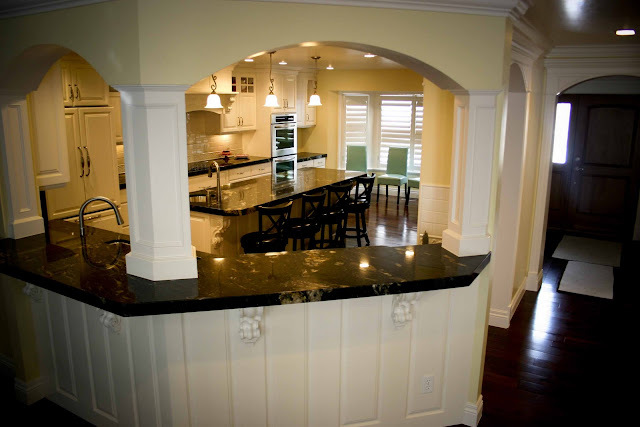 I did a post called "5 Most Common Granite Countertops Don'ts" last year. Most of these "don'ts" can be avoided by selecting a good fabricator. Remember YOU GET WHAT YOU PAY FOR when it comes to countertop fabrication and installation. I'm not saying you have to pay top dollar for your fabricator but be extremely cautious of a very low price. Steps For Selecting Your Countertop Fabricator. 1) Get bids from about three shops. You can get more, but I've found that three is usually enough. This should give you a good feel of the pricing. Honestly, the three bids should be pretty close. If they aren't maybe get one or two more bids. Make sure that you have a recommendation for each of these shops and have checked them out in person or at least online. I'd suggest getting your recommendations from friends and family, from your local slab yard, from your Interior Designer, cabinet shop or contractor. 2) Fax, email or bring your drawings to the fabricators that you have selected to get bids from. If you are getting new cabinets your cabinet company can provide drawings that are suited for this purpose. Just make sure the dimensions are accurate and legible. If they are drawn to scale you get bonus points! If you are just getting new countertops and are keeping your existing cabinets most fabricators will come out to your home and measure your countertops to bid for free. This is also a good way for you to get a feel of the shop and salesperson. 3) Make sure the bids that you get are apples to apples. The granite color, edge detail, slab thickness, sink type, backsplash, etc all make a pretty big difference in your final price. Even if you haven't selected your exact slabs, make sure all three fabricators are bidding the exact same options. You can have them all update their bids later when you have made all of your final selections, but this is a big mistake I see homeowners make. They get three bids and all three fabricators have bid something totally different. 4) Give the fabricator an idea of the time schedule you expect them to meet. Most fabricators are about two weeks out from the day they template. Everyone is different though, so be sure to ask. If they promise you "next day" turn around think about that for a minute. This probably means they are really slow, why are they so slow? Also, make sure to ask what is required of you before that clock starts ticking. Your cabinets obviously have to be in, your sink probably needs to be at their shop and your slabs and edge detail most likely need to selected. If your sink is backordered for a week that will most likely put you a week behind on the fabricator's schedule. These are all things you need to be sure to talk about before you select the fabricator. If you need a rush order this will generally cost you more since your fabricator will probably being paying their employees overtime. 5) Get to know the fabricators. "Were you satisfied with the quality of the workmanship?" "Was the work performed in a timely manner and was it on schedule?" "Were there any hidden costs sprung on you at the end of the job?" "Were you explained the basic steps of caring for your countertops?" "Is there anything you would have done differently?" 6) Ask the fabricator about their warranty. Good fabricators will carry a warranty of their work. There is the chance that you will need to use this warranty at some point. Also think about whether or not you can see this company in business in 10-20 years. They can't stand behind their warranty if they aren't in business. 7) Look up the company on the Better Business Bureau's website. Even just Google them. You are looking for red flags here. 8) See the fabricator's work in person. I know this is a lot of work on the homeowner's end, but you are spending a lot of money on your new countertops. You have got to be sure you are getting good, quality workmanship for your money. I recommend a visit to some of their job sites and/ or their showrooms. Make sure their quality of work meets your standards. Using these eight steps should help you find the right fabricator for you.